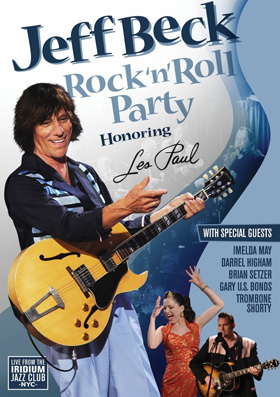 Jeff Beck throwing a party for guitar designer/innovator Les Paul sounds like a party you’d want to be invited to, right? Thought so. So, consider Beck’s latest DVD, Jeff Beck Rock ‘n’ Party Honoring Les Paul, your invitation. Filmed at the legendary New York City venue, the Iridium Club, one of Paul’s personally favorite haunts, Beck took it upon himself to invite along a few of his friends to help honor the six-string master, friends such as Brian Setzer, the husband/wife team of Imelda May and Darrel Higham, Gary U.S. Bonds and Trombone Shorty. Jeff Beck Rock ‘n’ Party Honoring Les Paul is a concert broken up into segments, the first being that of a rockabilly nature. “Train Kept a Rollin’” highlights this section before the page is flipped over to one helmed by May on vocals, as she takes a stroll through the Les Paul/Mary Ford catalog. “Sitting on Top of the World” and “Vaya Con Dios” are notable, though it’s May’s handling of “Tiger Rag” that steals the shows at this point. The next portion of Jeff Beck Rock ‘n’ Party Honoring Les Paul plays host to a brass section, as Beck takes center stage to fire off some instrumental numbers (“Sleepwalk,” “Apache”), but the exclamation point on this section is without a doubt the blues rendition of “Walkin’ in the Sand,” complete with Beck on guitar and May behind the microphone. The show then comes full circle as it returns to the rockabilly sounds, this time with Setzer doing his thing. It’s hard to choose a winner here, so just make sure you catch the performances of both “Shake, Rattle and Roll” and “Rock Around the Clock.” This last section is just Setzer being Setzer, plain and simple. Though Beck is clearly the star of Jeff Beck Rock ‘n’ Party Honoring Les Paul, he is humble enough to share the spotlight when necessary, giving a nice breadth to the concert as a whole. Well, Beck might be the star on stage, but it’s pretty evident throughout the night that the real star is Les Paul. Hopefully, wherever he is, he was watching.